The new SourceTree 1.4.0.0 includes the git-svn support feature. But I haven't been able to clone an SVN repository into a git local repo. Is there a tutorial to do this? Are you geting a specific error when trying to clone a SVN repository? 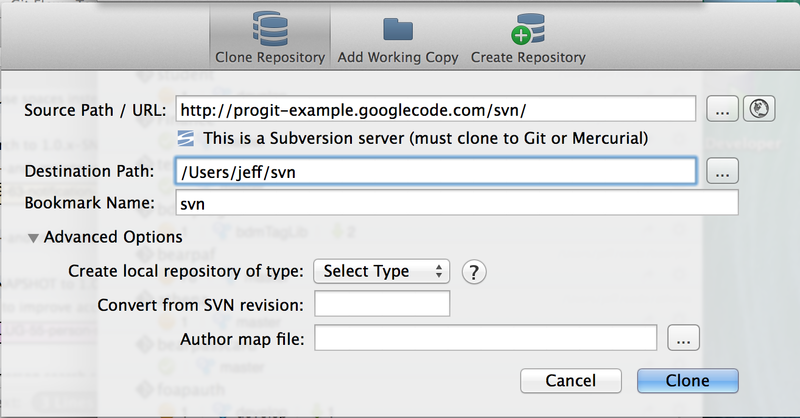 When you clone a Subversion URL, you have a choice - you can either clone a single branch of the repository (or the trunk), represented in Subversion by unique URLs, or you can clone from the root of the repository, and if the repository is in the standard Subversion layout (branches, trunk and tags folders in the root), then the conversion will pick up the branches and tags and convert them appropriately. I get this error: "fatal: repository 'http://progit-example.googlecode.com/svn/' not found"
trying to fetch from an svn repo as a remote of a local git repo. Interesting, it looks like that repository works in OS X, but not in the Windows version. Thank you, I'll do that and update this post when I get an answer. I'm picking up on this issue. I'm trying to clone a svn repository hosted at Unfuddle.comand get the following message (using SourceTree on Windows 8.1): This is not a valid source path/url. There is also related bug report on JIRA.